There are golf clubs and then there are golf clubs, those few whose names transcend the game. Walton Heath is one. Like so many of the finer things in life, much of Walton Heath’s charm is in its glorious subtlety. But if you come as a lover of the game, an aficionado of its history and a student of golf course design, you will leave feeling truly spoiled and envying each and every member of the club. There are very few golf clubs that can match the heritage, the pedigree, the tradition, the atmosphere, and the golf courses (two wonderful layouts). 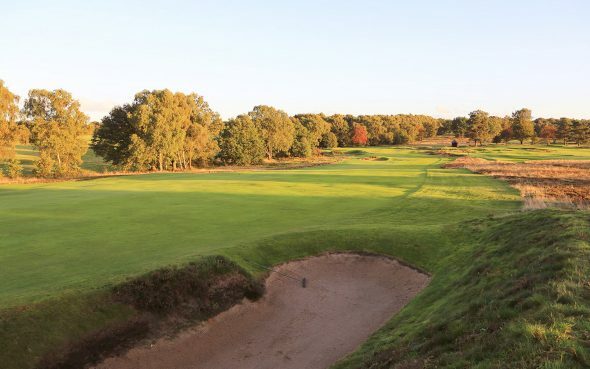 Admittedly, this particular belt of heathland that runs through the Surrey and Berkshire borders has more than its share of classic golf clubs but Walton Heath is a match for any and that, by definition, puts it in the very highest echelons of golf clubs anywhere in the world. Like the painting of an Old Master that reveals something new on every viewing, or a classic novel that is enriched with each rereading, the experience of playing Herbert Fowler’s designs improves with every visit. So nuanced, so delightfully subtle, yet so satisfyingly challenging, the true majesty – if that is not too grand a word for it – of both the Old and the New Courses is borne out only in the repeated playing. And that’s why you’ll leave envying the members. In suitably auspicious fashion, the Old Course opened in 1904 with an exhibition match between the legendary Triumvirate of Harry Vardon, J.H.Taylor and James Braid (who had already become the club’s professional and remained so until his death in 1950). They were the first of a very long list of star names to play Walton Heath, perhaps most famously the 1981 Ryder Cup teams. The US team assembled that year is generally held to be the greatest ever, with Nicklaus, Watson, Trevino, Miller, Floyd, Kite, Irwin, Crenshaw and Nelson all included (and it seems unfair not to complete the set with Pate, Lietzke and Rogers). Playing Walton Heath you really are walking in the footsteps of golfing giants. More recently the club has hosted the Senior Open Championship and hosts US Open Qualifying on an annual basis. Despite its stature, and unlike some other traditional members’ clubs, Walton Heath offers visitors a genuinely warm welcome. While the club (appropriately) maintains some of the more formal traditions of the game – jacket in the dining room, for example – there’s no uncomfortably snobby atmosphere to contend with and neither are you made to feel like you have just walked uninvited into someone else’s living room. The members here are used to sharing their club with visitors and are proud and happy to do so. Alongside the Old Course is the New (a relative term given that the first nine holes opened in 1907 and the full 18 in 1913), laid out over the same expanse of open heathland. Both courses are superb, and intertwine as they take you out across the heather, bracken and gorse, and back again to conclude on their parallel 18th holes. The Old Course at Walton Heath opens with a single hole detached from the rest of the course by the road you cross to reach the broad expanse from which the club takes its name. And the course gives no quarter from the very first shot, presenting you with a daunting 235-yard par three (from the tips) that demands you find your swing immediately. In fact, the opening six holes present as formidable a start as you are likely to find anywhere, certainly on an inland course. Stretching to 7,462 yards, and with a standard scratch score of four over par, it’s easy to see how this Herbert Fowler design maintains its illustrious championship pedigree. But don’t be put off – the daily tees make the course far more playable and, therefore for most, more enjoyable too. And if you are able to negotiate the tough start successfully, reward awaits as three manageable par fives in the closing third of the course present an opportunity to score (or salvage your round, at least). Most important of all, no doubt, is simply to enjoy the experience of playing at one of the great courses. Take in the scenery, the vistas of purple heather, and the memorable holes. You will most certainly want to return. Picking highlights on a world-class golf course is no easy task, not least because you feel you’re doing a disservice to those you omit. The truth is, you can make a case for just about any hold on the course, but our particular favourites were in those sections where the heather was at its expansive best, bunkers were visually intimidating, and the holes were great examples of classic heathland design. Holes 3, 4 and 5 are a perfect example. The run opens with what appears to be a pretty benign, perhaps even driveable, short par four. But for all the mediocrity in length, the little ruts of heather, deep bunkers, steep green-side run offs, and the narrowing fairway do more than enough to complicate what would otherwise be a very straightforward hole. One of the toughest on the course follows; an unusually flat but formidable par four with something of a magnetic bunker in the centre of the fairway at the ideal driving distance. Lay-up short and you will be faced with a long strike into the green. Attempt to avoid the bunker and it becomes a tight drive, with heather punishing anything missing the fairway and very likely to cost you at least a shot. Completing the set is the downhill dog-leg left par four 5th hole, which is a delight and one of the most satisfying approach shots of the day. A good drive and mid-iron to the the tiered, rippling green, leaves you still with much to do. And if you have missed the green, your chipping skills and imagination will be tested to the limit. The long par three 11th and short par four 12th are a fine brace of holes. The par three requires a big hit, around 200 yards, in order to leave a putt that will in all likelihood have to account for the large back-to-front slope on the green. Miscue and bunkers lie in wait on either side of the target. A chance is offered at the dog-leg right 12th, with a mid-length clip from the tee to the corner of the fairway leaving a gentle pitch up to the green. Played with care, it will yield a good chance, but bite off a little too much and you’ll inevitably end up in one of those frustrating battles to save par (or worse) on what at first sight looked like a comparatively easy hole. A lovely par five lined by heather, all burgundy and claret when in bloom. From the tee, the fairway bunkers appear to encroach, forever shrinking the landing area from which a downhill approach is played to a green guarded by slopes, bunkers, and run-offs liable to gallop off with your ball. It’s a terrific looking hole, and in our book the most enjoyable par five on the course. Walton Heath’s Old Course is a genuine classic. A championship course that for all it’s subtlety and fairness is formidably challenging. In many ways it epitomises all the clichés that have been used to laud the great Surrey heathland courses and, after one hundred and eleven years of play it’s perhaps impossible to say anything new. But saying something new isn’t really necessary, especially given that it’s the well told story that makes strolling out on to golf’s most famous heath such a memorable experience. And that story sees the Prince of Wales (later King Edward VIII) appointed Club Captain; one of the greatest names in the game serve 46 years as the club professional, and one of the finest architects of his era create not one but two classic courses. This rich golfing history can be explored courtesy of the trophies, paintings, medals, scorecards, and other memorabilia that adorn the clubhouse and form as much a part of the Walton Heath experience as playing the golf courses. Embrace all this, indulge in lunch, and you’ll leave with your golfing appetite stated and an ambition to return again very soon. The club is located in Walton on the Hill, in south west London. It is easily reached by car from the A3 and M25 (J8), and has several local railway stations within a couple of miles. Both Heathrow and Gatwick airports are easily accessed via the M25.